“Love isn’t how you feel, it’s what you do.” Madeline L’Engle, Wind in the Door (1974). As chaplain to the community and for the people of Wake Forest, Ed Christman was always present in times of grief and mourning. He was involved, in some way, with many of the funerals within the Wake Forest community — faculty, staff, and on rare occasions, students. Ed would work with the family members to organize a service, gather musicians, write the program, and contribute scripture, prayer, and/or eulogy. Over the years, he has led or participated in funerals for many of his own colleagues and friends. Ed Christman in 2001. Photo by Snyder Photography. Ed said that in some ways, funerals are easier to lead than weddings. A funeral congregation has no need for perfection; they only hope for meaning and blessing amid the pangs of grief. Those at a funeral are forgiving of errors, be they mispronounced words or breaks in the flow of the program. It is already clear that life itself is imperfect and confusing; the service is allowed to be authentic. Family members often wrote letters of deep gratitude to Ed for his kindness and and ability to guide them through grief, especially true on the rare occasions that a student passed away. The first step was a meaningful service for their loved one. After the service, Ed would be there to help family and friends with what to do next. This might be how to deal with the details that death brings or simply how to keep going after a loss. He was also there to help students who lost a parent or other family member, often becoming the person who would shepherd the student through the news of loss. “Jesse had large hands open to other hands, welcoming to life lived in the reality of the cross and resurrection of Jesus Christ. Jesse had a large heart open to hearts beating rhythms of joy for he knew who he was and where he was going–a sojourner in the wilderness bound for the Promised Land. “And the gospel speaks of death in a life-giving way. Jesse’s final illness was a testimony. One of his nurses, seeing how he confronted pain and death’s reality declared her life has been changed forever. Indeed, Jesse preached his own funeral as long as God breathed life into him. “In these last days, Kim and Stan played [music] in his room; ‘that’s mighty beautiful, mighty beautiful’ — the music of the heart can strengthen us one and all. Indeed, we can say with Jesse, whether speaking of his life or our own, it will be all right because we are knit together by what God has provided, whether in joy or sorrow, family, church and labor to help us build [that] not made with hands. Sometimes the whole campus had reason to grieve. At these times, Ed led campus-wide services for the community. 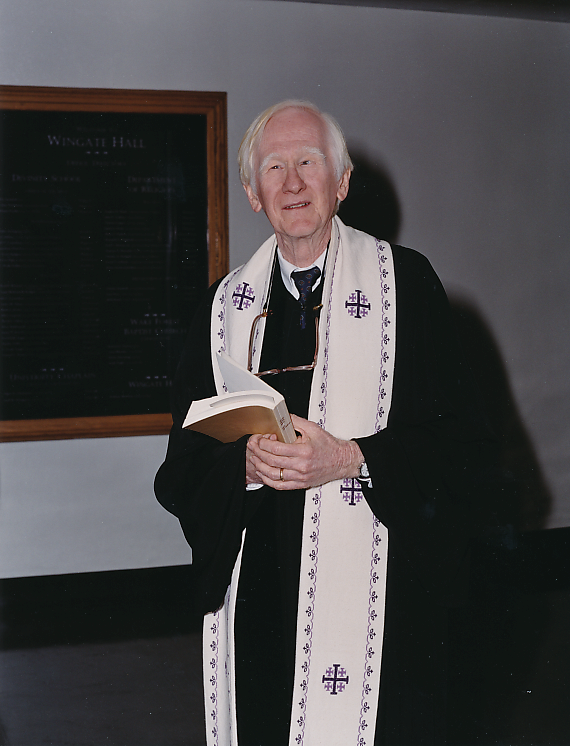 For example, he directed an annual Service of Remembrance to honor the memory of for Wake Forest faculty, staff, alumni or students who had passed away in the previous year. This service was held on Homecoming Weekend each fall. 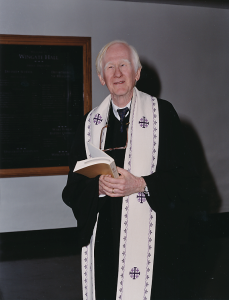 He also led the campus-wide service on the evening of September 11, 2001. One year later, he organized a Remembering and Hoping Service on September 11, 2002. Professors Ed Wilson and David Levy, Jill Crainshaw of the Divinity School, Associate Dean Sam Gladding, University Police Detective James Rae, and students Badriyyah Al-Islam and Candace Mathis were on the program. He organized a service to mark declaration of war on Iraq in March 2003. Ed’s constancy brings to mind a radio essay on the importance of such services called “Always Go to the Funeral” written by Deirdre Sullivan. It aired in the National Public Radio series This I Believe (2005). From one of Ed’s sermons: “The most significant events in your life and mine are not propositional. Who remembers the exact words at a frat initiation, or at a marriage, or what the new boss said about the job? Who recalls what the teacher said? Who recalls what the minister said at your bedside?